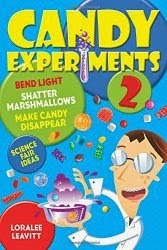 I was interested to find an ehow.com article on science projects which references my "Dissolving Hot/Cold" experiment The author instructs students to use candy such as Smarties, Lifesavers, or M&Ms, and to time with a stopwatch how long it takes the candy to dissolve. While timing how long it takes candy to dissolve could yield some interesting data, you need to choose carefully what kind of candy to test. Many candies, including Lifesavers and Smarties, take quite awhile to dissolve. M&M chocolate will not dissolve in cold water. If you want to measure how long candy takes to dissolve, I suggest using something that dissolves quickly, like the candy shells on Skittles or M&Ms. Try timing how long it takes for the color to dissolve off of each piece. Otherwise, use small pieces of identical candy (I wonder if cinnamon hearts would dissolve quickly). Avoid doing this experiment with pressed dextrose candy such as Smarties (they take hours to dissolve) or chocolate (if you are trying to compare dissolving times).